My most recent project was designing a brochure, certificates and the race singlets for Tour de Peninsula, run by my local orienteering club, Peninsula and Plains (aka PAPO). I do a lot of design-type work for the club on a volunteer basis including the current club orienteering top, certificates and promotional material. It's pretty fun as I pretty much get free rein which I wouldn't get elsewhere. 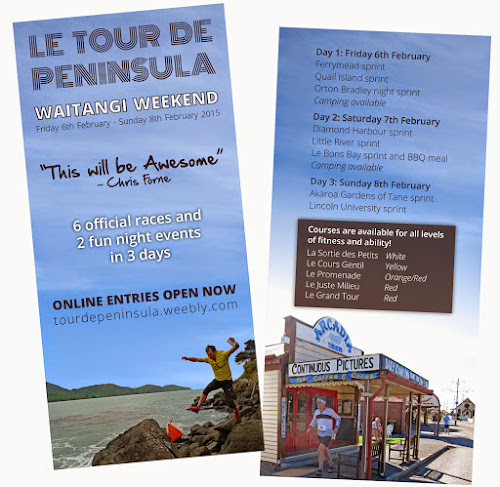 The first design project for Tour de Peninsula was the promotional brochure, a double-sided DL flyer giving out the basic information for the event. There were also overall certificates for 1st, 2nd and 3rd. These are printed in advance and are 'general', as in they don't have space for a name. There has been a bit of debate about this in the past within the club but it ends up being the easiest way to go for everyone. Le Maillot Jaune: the yellow jersey is worn by the current leader of the cumulative results of the Tour. Le Maillot Blanc: the white jersey is worn by the current young leader (under the age of 21 for this competition). Le Maillot Vert: the green jersey is worn by the current leader of the "Sprint" competition. Le Maillot a pois Rouge: the red and white spotty jersey is worn by the current leader of the "King of the Mountains" competition. I went with a fun, cartoon-type style but firmly cementing it within the Canterbury/Banks Peninsula region. At first the idea of having a control flag in each map location was proving difficult as many were clustered around a small area but it really came to life in the end. I was pretty happy with how they turned out but I find it quite surreal to see clothing you've designed on the computer in real life! Below you can see a couple of the singlets in action during the weekend. Thanks to Mike Harding and Jan Harrison for the singlet photos.